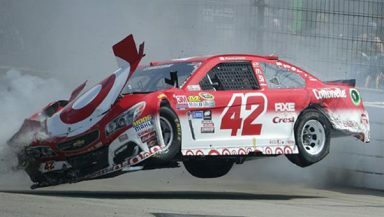 Kyle Larson walked away from a scary wreck in the early stages of today’s race in Fontana. Hurtling down the backstretch, the driver of the No. 42 Chip Ganassi Racing Chevrolet cut down his left-rear tire, turned into the outside wall, turned down the track and slammed the wall head-on. The car actually got airborne for a few seconds before coming back to Earth. “I was going down the back stretch and I think it was my left-rear tire got cut,” Larson said. “It must have ripped the brake line because I went to push the pedal and it went straight to the floor board. I couldn’t slow down. It was definitely a hard hit there, probably one of the harder ones of my career. Even before that we were pretty sub-average there, we were pretty bad. Disappointed in our run today, but glad I’m alright. It added to a miserable weekend that included being wrecked by Greg Biffle the day before in final practice. Larson leaves Fontana, California 24th in points trailing Kevin Harvick by 108 points.